Isn't the heel flap detail devine? Just love it!!! Well, onto the pattern. Needles: 2.75mm. I've written the pattern to be knitted using two sets of circulars. Cast on 32ST using long-tail cast on (or any elastic cast on). Distribute 16ST per circular and join into round, placing marker for beginning of round if desired. Work 22 rounds of K2P2 ribbing, starting with K1, P2, and ending with K1, so that the first and last ST on each circular is knit. After these 10 rows, turn heel. Row 1: K10, pick up 8ST along left edge heel. Work 16ST rib as established. 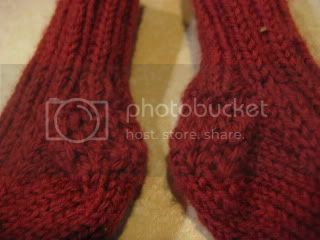 Row 2: Pick up 8ST along right edge heel and knit across to last 3ST on needle. K2tog, K1. Work 16ST rib as established. Row 3: K1, SSK, K to end of needle. Work 16ST rib as established. Row 4: K across to last 3ST, K2tog, K1. Work 16ST rib as established. K16, Rib 16 as established until foot is ~ 1 inch (2.5cm) from desired length. Use kitchener stitch to join the 6 stitches on each needle and weave in ends. 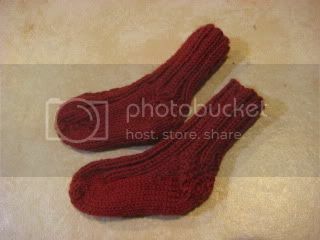 I hope you enjoy knitting this pattern. I've found it to be super quick, easy and satisfying. I hope you do to!! !